With the constant reporting of negative stories surrounding smart homes, such as security flaws that lead to hacking and data snooping by hardware suppliers, I've never found smarthomes interesting. That being said, I'm heavily tied into the Google ecosystem of software and hardware, so I had no problems buying a Google Chromecast for my TV. I eventually ended up slowly acquiring other "smart" device such as light bulbs, outlets, switches, etc that I will go into more detail below. Now, I'm always on the lookout for the next greatest "smart" device to add to my home. No Batteries - The 4 or 5 smoke/carbon dioxide I have littered the house give me enough of a headache of climbing up a chair to swap out the 9V battery. The caveat being I'm fine if the battery can be recharged, possibly with solar panels. No Subscription Fee - I'm kind of cheap, and one subscription fee won't break the bank. But as I build up a smarthome, I'm likely to add many future devices can add up. I have no problem with self hosting software on home servers, if necessary. Likely one of the first devices people own, it makes watching YouTube and many other videos apps much easier. Also works with Netflix, but doesn't work with Amazon Prime Video (Google and Amazon have disagreements). Even though the Google Chromecast does make "dumb" TVs smart, I don't really consider the Google Chromecast much of smart device. But I don't have much of a need to automate, either in an adhoc or scheduled manner. Instead, when I want to watch TV, I fire up an app, turn on the TV, and start casting. That being said, of all my smart devices, the Chromecast is the one that I find the most useful. I can spend hours per sitting watching TV, changing videos, collaboratively with other people. I currently own both 2nd and 3rd generation Chromecasts, but not the 4K versions. I do have a 4K TV, but I don't subscribe to any 4K content (I don't have a Netflix subscription). Unfortunately, the smart TV (by Sharp), didn't live up to the name of being Sharp. On the surface, I assumed it would be convenient to control apps right from the TV remote, without the need of a smartphone. And although for the most part it is true, the fact that a handful of apps are constantly asking for me to sign in, it quickly got old typing in long unrecognizable passwords (in the name of password security). Then there's the problem of apps that I don't have on the TV won't work. Plus, the speed of browsing on the TV does feel slower. I also don't like that my Smart TV is always prefixed with [TV] or something else. From an completely anesthetics point of view, it didn't feel clean. I all honesty, the only reason I continue using the Smart TV's smart home features is for YouTube (from my smartphone), which still functions exactly as I expect. I would probably never purchase a Smart TV ever again. Instead, I would purchase a dumb TV, and get a Chromecast. This is one of the first "smart" devices I acquired. I didn't actually purchase it, but got it for free from work as part of a pharma drug launch gift. It actually spent a year in the original box, as at the time I had no interest in smart homes. But when I did hook it up, I found how easy it was both setup (requires downloading the TP-Link app) the pairing with my home wifi. From there, the app linked seamlessly to Google Home. As of the writing of this, Google Home is still fairly basic, only able to turn things on/off with some more advanced features of Nest (Alphabet company) products. The smart light bulb is most useful from lamps that are hooked up to an outlet not controlled by a wall switch. Unfortunately, I don't have many desk or floor lamps that fit that profile, so I don't yet have a need for this. Therefore, it doesn't work well for outdoor lights (usually controlled by a switch), or if you have canned/recessed lights. Light for a kids room for them to learn to turn things on/off. The smart light didn't solidify my belief in the need for a smart home, but did introduce me to the smart home products of TP-Link and Google. I got this from OhmConnect (a power saving company) where they offered it as part of program that encourages you to link your home with their service. They figured that by using a smart outlet, you can set it up so OhmConnect automatically shuts off power to the plug during their weekly OhmHours to both save power and money. Read more at one of my previous posts. But since I got this for free, I figure why not set it up and use it. Since I already had the TP-Link app from the smart lightbulb, the setup for the smart outlet was nearly the same, and even faster. No complaints since I got it for free, but I got the original generation which would take up both outlets and only offer one in return. But powering it is as simple as plugging it into an existing outlet (preferably one not controlled by a wall switch). This smart outlet plug differs from other similar concepts since because it plugs into an existing always-on outlet, it doesn't require any installation (no shutting down power at the circuit breaker, no unscrewing anything). Since it's very mobile, you can move it to a different plug on demand. It can be used to control Christmas lights during the holidays, or a street facing window to randomly turn lights on/off if you're out on vacation. This is where my smart home journey truly began. I hooked a power strip up to the Smart Outlet and had it shut down most of my power usage in my home office. Connected to the power strip was laptop charger, two monitors, sit/stand desk, speakers, desk lamp. The only thing I left off the smart outlet was a small home server I still utilize and want running at all times, since it server files and runs automated tasks. I was very surprised how convenient OhmConnect was at promptly turning off power to my office setup during the once a week OhmHours. After experiencing this new level of convenience, I became interested in how I could extend the usefulness. That's when I further setup and learned the commands for Google Home so I could control my smart Wifi plug with Google Assistant on my Android (Google Pixel 2). Next, during the Holiday season 2018, Spotify was running the promotion that offered a Google Home Mini for $1 + a trial subscription of Spotify premium. At the time, I had heard stories of Amazon's Echo being slow (in their home setups when integrated with iPhones). I had also received an Amazon Echo (as part of the same gift package when I received the smart lightbulb). But immediately decide to resell it on Ebay. My biggest concern with setting up Google Home or Amazon Echo was the stories of the devices listening, when they claim they weren't (new story). Though this story hit Amazon, it's completely plausible the same could happen to another company, Google included. But for $1, I figured it was worth a try. Since we didn't want it in the bedroom or the main living space, due to fear of over listening or recording, I decided to put it in my office where I spend a lot of my time, and already have most of my smart home devices. 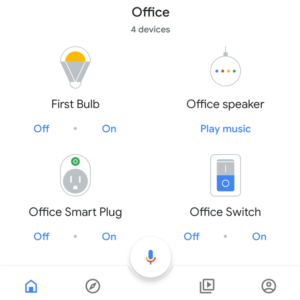 Now, twice a day, I can easily shut off my electronic desktop by saying "Ok Google" + "Turn off Office" in the evening, or "Ok Google" + "Turn on Office" when I return home from work. The built in speaker it fairly weak and there is no AUX port on the Google Home Mini to plug in external speakers for a better speaker. If it did have that, there would be a much higher chance of me verbally starting and stopping Spotify when listening in my home office. All in all, the Google Home Mini is handy, but not surprisingly a smart device I would require in my smart home setup. This is mostly because I carry my Pixel 2 with me everywhere, even in my home (I have to get my steps counted). Again, I purchased this via OhmConnect, as OhmConnect was offering a $50 rebate and they claimed I could get an additional $100 back in rebates from PG&E, though I only expect to receive $50. So all in all, I would only pay $20 or $70 for a new smart thermostat. In the past, I had avoided purchasing a Nest Thermostat because I had also heard from friends that the Nest was not very good at "learning" behaviors. Friends who bought new homes with Nest thermostats built in claimed their heater turns on even when nobody was home turned me off from the idea of upgrading. But again, at $20-$70 after rebates, I figured it was worth experimenting. I was partially afraid that the Nest Thermostat would not be compatible with my old house, especially after I took down existing thermostat and only found two wires! But after consulting the Nest website and "Compatibility Checker", I found it did work! And when the device arrived, I eagerly tried installing it. All I had to do was take the two old wires out and connect it to the Nest Thermostat. After downloading the Nest app and setting up a separate account (different from Google account password), I found that it worked flawlessly. After several months of using the Nest Thermostat E, which isn't as colorful as the original Nest Thermostat, but still better looking than my old plastic thermostat, I found the turning the thermostat on/off from my phone, Google Home Mini, or even the device itself on the wall was easy. I'm waiting/looking for a killer deal to purchase a second Nest Thermostat to replace my second thermostat upstairs. My latest purchase (after finding a deal) was the TP-Link Wall Switch. After the simplicity of setting up my second TP-Link device, I knew I wanted to keep my smart devices in the same family. So I specifically waited for TP-Link products. The reason I couldn't just setup a Smart Wifi Power Outlet was that it didn't seamlessly work with the wall switch. If the wall switch was already off, the devices linked to the power outlet wouldn't register as on to the smart home, and then be out of sync with the rest of the setup. Purchasing the TP-Link Switch one was a much riskier setup for me. I don't know much about power and try to avoid power and gas in any DIY home project as much as possible. My research showed the most smart switches require a neutral wire, so that it always has power even when off. Again, since I'm in an older house, I just wasn't sure (even looking at advice online) whether my switches have neutral wires. I finally decided that I was fairly certain I had one, and in the worst case I could hire an electrician to install neutral wires. When the switches arrived, I again was eager to setup the switch in my home office, to complete the smart home "office" setup. After this switch was setup, I could completely shut off my office with one command. This setup required much more time, as I had to shut the power off at the circuit breaker. After taking out the power cables, I had to keep straight which cables connected where. When I was fairly certain I had it right, I flipped the circuit breaker back with fingers crossed I wouldn't see sparks. Even worked fine. From there, configuration via the TP-Link (Kasa) app was the same simplicity as the smart lightbulb and smart plugs. The last part of the installation was shoving all the cables in wire nuts into the smart outlet. I couldn't get their fancy wall plate to snap in, so I opted to put my original wall plate back. Now, I'm just complete that my home office now have all the smart home devices. It does make turning power on/off much easier. As to how much power I'm really saving, that's difficult to measure. Each of the WiFi based smart home devices do require constant power, so the total might not be any better. Now that my Home Office has been setup with a smart home setup, I'll have aspirations to do additional setups. In my office, I think it would be nice to avoid having to verbally talk to expand the setup. If there are some sensors I can install that plug directly into the wall, that is a direction I can go to configure when to automatically turn on/off my office. I would also like to see Google Home improve to include services currently offered by IFTTT, but more advanced that would allow "AND" and/or "OR" conditions for more specific rules. Google Home is currently not automated... the only way is verbally via Google assistant or touch via the Google Home app. Additionally, if there are affordable blinds or blind retrofits that again don't require batteries, I can have my blinds open in the morning to heat up the room and close in the evening or on cold days. Is Google A Monopoly of Information? Share your thoughts with the community Get Started!